distribution to ensure the greatest ROI. EstesGroup is a worldwide leaders in Epicor and NetSuite ERP Consulting and Business Process reengineering and improvement. Stern was hired by this B2B company to structure and execute a B2B Inbound Marketing, Content Marketing, and Social Media Marketing strategy. Through a strategic combination of responsive web marketing design, inbound follow up campaigns using Infusionsoft, video YouTube marketing, LinkedIn personal and company posting we are and continue to achieve an astounding EIGHT TO ONE return on investment for EstesGroup! When preparing to market EstesGroup, we took a look at what specific services earned them the most profit. 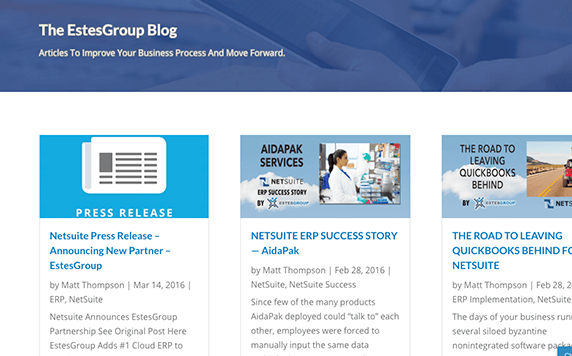 How and why our creative collaboration is working to increase EstesGroup’s B2B ERP business. Every page of the new EstesGroup responsive website we developed includes a creative call to action that leads the visitor to start a conversation their website includes a unique “ask” that starts a conversation and is driving lead generation. From webinar invites to white papers, case studies, and video lessons, we are starting more and more meaningful conversations between EstesGroup and their target market every day. Our Content Marketing SEO is working as EstesGroup continues to rise to the top of Google for long tail and short tail keywords and phrases. We focus on specific industries and their needs and desires: marketing the benefit of EstesGroup to CEOs, CIOs, and COOs that desire the benefit EstesGroup has to offer. Our interweaving blog layered with internal links is diversifying the digital footprint of EstesGroup to companies that will benefit from them the most. These blogs ALL have an ask, a call to action, and are essential to our Social Media Marketing Engagement and Lead Generation and Nurturing Strategies. Every blog, social media post, and landing page our creative marketing team creates includes an inviting call to action that moves your potential client from passerby to active contact and participant. To begin, we invite you and your B2B or B2C team to audition to work with us.